Volkswagen of America has announced that the Volkswagen BUDD-e has been named “2016 Concept Truck of the Year” at the 15th Annual North American Concept Vehicle of the Year Awards. 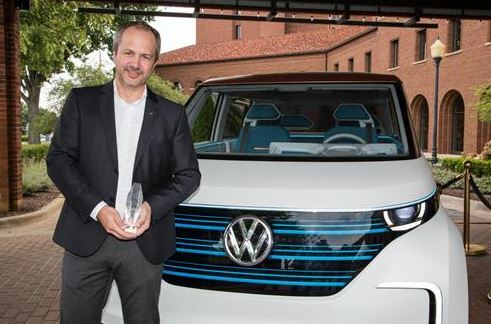 Judges recognized the all-electric microbus concept for raising the standards of automotive design, with features that address both the utility and mobility needs of the present and future. The award ceremony was held at the Concours d’Elegance of America at St. John’s in Plymouth, Michigan at the end of July. The first Volkswagen vehicle built using the company’s Modular Electric Toolkit (MEB), the BUDD-e captures the brand’s heritage, while offering a glimpse into the company’s next-generation connectivity, infotainment and EV technologies. The BUDD-e concept’s highlights include: A 101 kWh battery that gives a manufacturer estimated range of up to 233 miles, gesture control 2.0 that enables intuitive operation of interior and exterior features, and seamless communications with smart home and smart car technology, and infotainment technologies that turn travel into a fully interactive, intuitive experience. More than two dozen jurors participated in the selection process of the North American Concept Vehicle of the Year Awards. Twenty vehicles, each introduced to North America during this season's auto shows in Los Angeles, Detroit, Chicago, Toronto, and New York, were judged.